In order to understand the significance (or lack thereof) of the effect we are having on the climate, it is helpful to look at pictures of climate past. Not surprisingly perspective makes a big difference in the story the pictures tell. And past performance is no guarantee of future results. I don’t think that the pictures below prove either way the effect of anthropogenic activity on climate; but they’ve all been entered as evidence into the debate. And there is a debate whether people on either side of the argument find that comfortable or not. The graphs below are from the latest UN-sponsored IPCC study. The one immediately below clearly shows temperatures rising since 1850. There’s some debate about the methodology but the shape of this graph is generally accepted. Since the temperature increase dates from the beginning of the industrial age and the warming apparently accelerates as greenhouse gasses accumulate in the atmosphere (picture below this), it is used as strong evidence of cause and effect and projected into the future (which I’ll write about later). 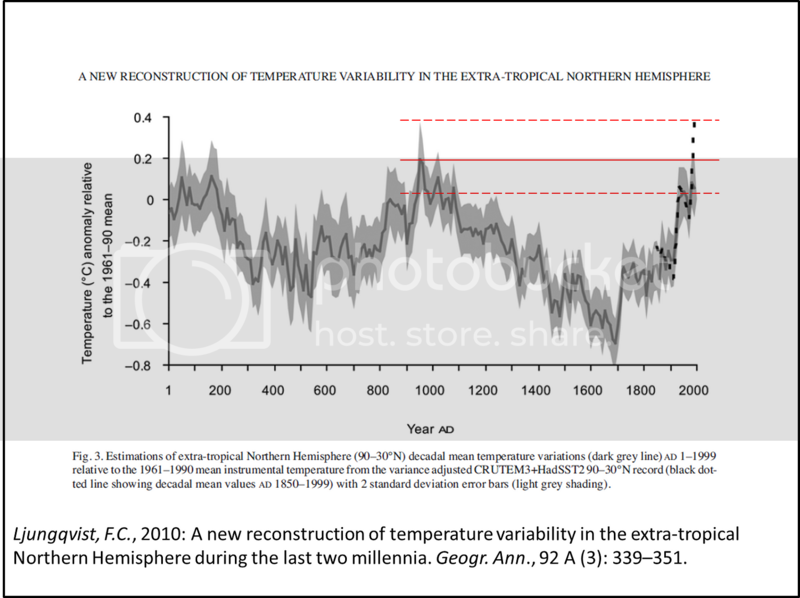 For the next graph we widen our perspective to warming and cooling over the last two thousand years. Here we see that global temperature seems to oscillate and that it was really cold about 1700 and very warm around 900. We are now recovering from what is called the “Little Ice Age”. The green line, about which there is some debate, does show a noticeable spike now above any previous peak. This spike is often cited as evidence of anthropogenic warming. But when scientists look at data they also look at the likely accuracy of the measurement. The graph below shows the same data as the graph above but shaded to show what range of possible actual temperatures the graphed line represents. All measurements are subject to some error and estimates from before anyone was directly measuring temperature even more so. It is highly likely that the pre-measurement data obscures any short-term peaks (but that doesn’t prove there were any). 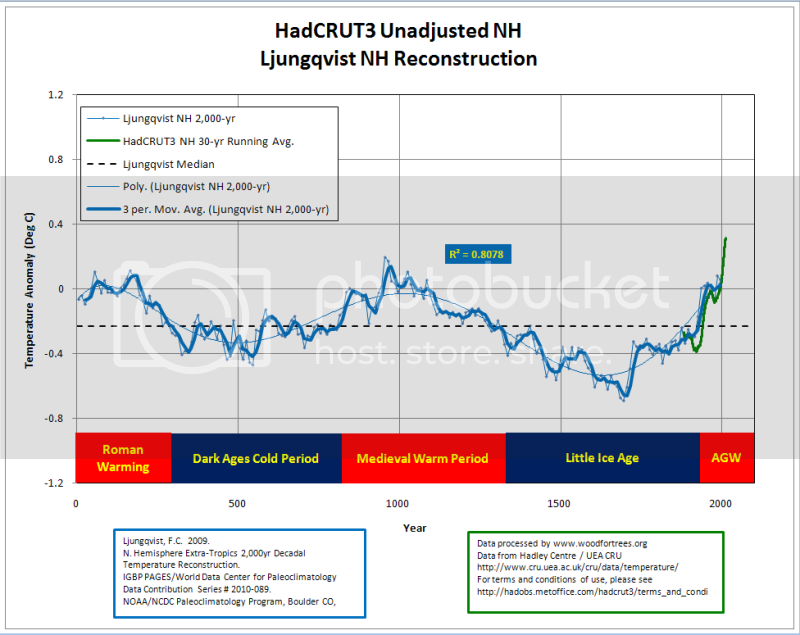 The graph below shows that, within the range of likely error, the current peak – even the disputed peak at the end – may not be a onetime event. Now let’s look back 4500 years. It was much warmer than now about 100BC. There were certainly humans then and they had fire but they weren’t making any significant change to the atmosphere. 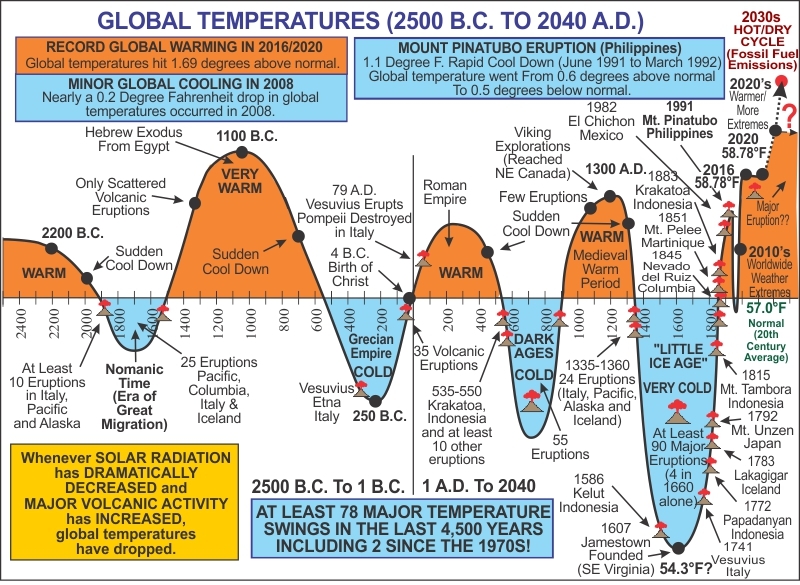 The scientists who made this chart say: “We, Cliff Harris and Randy Mann, believe that the warming and even the cooling of global temperatures are the result of long-term climatic cycles, solar activity, sea-surface temperature patterns and more. However, Mankind’s activities of the burning of fossil fuels, massive deforestations, the replacing of grassy surfaces with asphalt and concrete, the ‘Urban Heat Island Effect,’ are making conditions worse and this will ultimately enhance the Earth’s warming process down the meteorological roadway in the next several decades.” After that they predict natural causes will take over again. Finally if we look back to before there was life on earth, we see that temperature oscillations are the norm. The huge drop in CO2 (purple line) at the beginning is because of the emergence of photosynthesizing plants. In the couple of million years since our ancestors evolved from the primate pool, temperatures have been relatively stable at the low end of the historic range. But “relative” covers a lot of ground. 20,000 years ago Vermont was covered by a mile of ice and migration to North America was by land across the Bering Strait. Lots of warming and lots of rising seas since then. So what should we make of all this “evidence”? We urgently need to better understand the causes of past climate change. No reason to think those same causes aren’t still at work. Could show, for example, that we’re in for extreme warming even with drastic reduction in the emission of greenhouse gasses. I hope government-funded research in the new administration will be on natural as well as anthropogenic causes. I don’t hope the research will stop; we do need to understand this. Looking at the last 160 years by itself can be misleading (doesn’t mean it leads to the wrong conclusion, though). Climate change is apparently chaotic; its graph a fractal. Small inputs can have huge effects and vice versa. Remember the butterfly wing in China that can cause a hurricane in the Florida. From a mathematical point of view, this means the linear extrapolations of the effects of increasing concentrations of greenhouse gasses in the UN report are suspect (but more on that later).